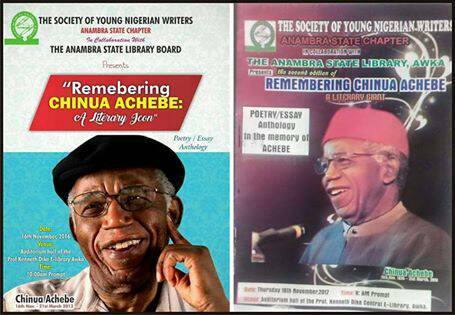 The Society of Young Nigerian Writers, Anambra State Chapter, invites poems and essays from writers across the world in collaboration with the Anambra State Library, for the Third edition of Chinua Achebe Anthology of Poetry and Essay. The anthology will be unveiled at the grand finale of the third edition of the 'Chinua Achebe Literary Festival' tagged: "Remembering Chinua Achebe: A Commemoration of A Literary Star". This annual festival with its third edition as a literary event was initiated to honour, celebrate and learn from the life, works of the Literary Star, late Prof. Chinua Achebe, and recognize his great achievements and legacies. The festival which started in 2016, will hold on the 16th of November 2018 at the auditorium hall of the Prof. the Kenneth Dike Central E-Library Awka, Anambra State. Entrants can submit as many entries as they wish. Essay or Poetry MUST be in the memory of Achebe, and may focus on his life, works, personality, writing style or other areas. The essay or poetry should be brief and concise. A maximum of 500 words for essays or reviews, and a maximum of 40 lines for poetry. Author’s information - contact address, phone number, E-mail address and a short bio of no more than 50 words should be included in the submission. Submission is open to all. Writer may choose any interesting title of their choice. 9. Entries could be written in either English or Igbo Language. 10. Entry MUST be the original work of the author/poet. Submission closes on 30th October, 2018. Late Entry will not be accepted. All accepted essays and poetry will be published in the 3rd 'Chinua Achebe Poetry/Essay Anthology', as well as in various literary blogs, journals and websites, to the writer’s credit. Aside the publication and promotion of the accepted entries to the authors' credit, authors/poets of the best ten essays and poetries shall be given outstanding recognitions, certificates of award and other rewards at the event. Entrants (if present) shall be allowed to present their essays/poems to the audience at the event. Online promotion of the entrants and their entries. 07062696058, Ojiego Austine Chidiebere (P.R.O/Media Director Society of Young Nigerian Writers Anambra Chapter).